The Man Who Sold the World (Bowie, 1970). The Man Who Sold the World (Lulu, 1974). The Man Who Sold the World (Bowie with Klaus Nomi and Joey Arias, 1979). The Man Who Sold the World (Nirvana, 1993, rehearsal). The Man Who Sold the World (Nirvana, 1993, broadcast). The Man Who Sold the World (Bowie, live, 1995). The Man Who Sold the World (Bowie, broadcast, 2000). The Man Who Sold the World (Bowie, live, 2004). On the last day of mixing the LP, Bowie had yet to come up with a lyric for a final track that was cued up on the deck. Tony Visconti recalled waiting, tapping his fingers at the console, while Bowie sat in the reception area of Advision Studios, scratching out a lyric on paper. Bowie ran into the booth to record his vocal, the track was mixed in a few hours and the tapes were sent off the same night. You’d expect something like “Black Country Rock” from these straightened circumstances: instead, it was “The Man Who Sold the World,” Bowie’s finest lyric of the record. Bowie had found his album’s real name. “The Man Who Sold The World,” nearly an afterthought, had turned out to be the prime mover of the LP all along, like a song whose key is only revealed in its last bars. While it’s basically a first draft (and it shows at times: “I gazed a gazely stare” is pretty rough), the lyric’s forcibly-spontaneous origins also created its uncanny resonance. Metrobolist could be a play on somnambulist, and “The Man Who Sold the World” could be a sleepwalker’s journal entry, a piece of automatic writing. Like a dream, “The Man Who Sold the World” has a score of fathers—its title is likely from Robert Heinlein’s The Man Who Sold the Moon; its opening lines suggest Hughes Mearns’ “Antigonish,” as quoted above, or, even more likely, the WWII-era song based on the poem, “The Little Man Who Wasn’t There“; its image of a man meeting his double, spiritual or corporeal, derives from everything from Wilfred Owen’s “Strange Meeting” to Conrad’s “The Secret Sharer” to Ray Bradbury’s “Night Meeting,” in which a man and Martian cross paths in the deserts of Mars one night, each convinced that the other hails from the distant past. 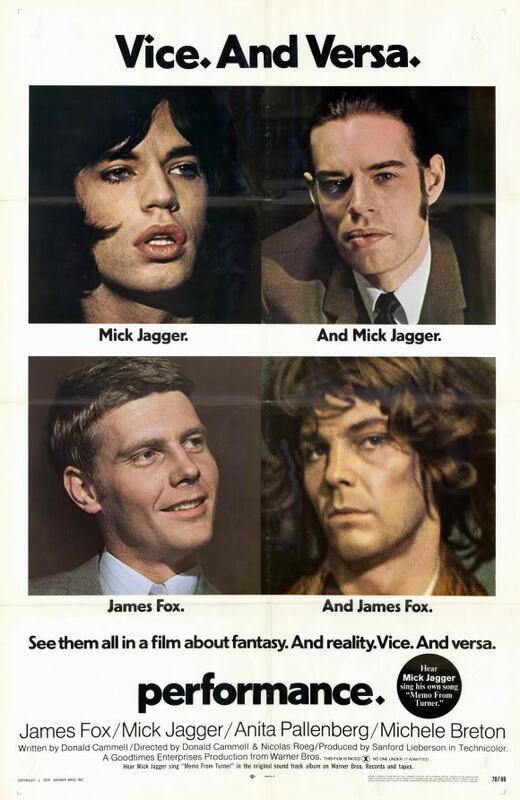 And the song’s symbolic twin was a film from the same year (while shot in 1968, it finally premiered a few months after Bowie wrote his song): Performance (fittingly, the film had two directors: Nicholas Roeg and Donald Cammell), in which a glamorous gangster (James Fox) holes up in the mansion of a decadent pop singer (Mick Jagger), with the two playing out each other’s roles—a talented criminal, the film suggests, is as much an artist as a true artist can be a criminal. Turner (Mick Jagger), in Performance. 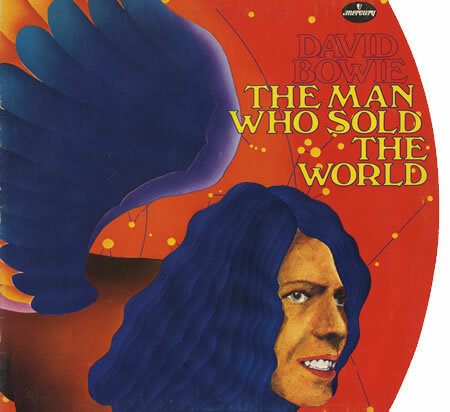 “The Man Who Sold the World” has two verses (one pairing in a song filled with them: for example, Bowie sings two pairs of notes at the start of each line of the chorus): the first is Now, with the narrator encountering himself or Another (cf. Rimbaud’s “Je est une autre”), the second verse is Afterward (or Before). Where most of Bowie’s lyrics on the LP are oddly-phrased and filled with bizarre imagery, “The Man Who Sold The World,” two verses of eight modest lines and a chorus of four, has a cold simplicity, its tone that of an old riddle. So the singer passes a man on the stair, although the singer isn’t truly present at the meeting. Is he asleep, dead, exiled from his own time? Whatever his own situation, the singer is more bewildered by the man he encounters. “I thought you died alone, a long, long time ago,” he says in astonishment, as though he has met a lost self, or the self he once imagined he would be, or the self he one day will be. The chorus is the other’s response. “Oh no, not me” the specter (or the man) says, happily denying the charge. You could read it as “Death hasn’t come for me, it never will.” After all he’s the Man Who Sold the World, the extremity of all the extremities that this odd LP has offered. He could be a con man, like Delos Harriman, Heinlein’s Man Who Sold the Moon, who swindles the masses into financing his dream, only to be denied fulfilling it. He could be the Bowie of 1975, who has become world-famous at the price of his sanity. Or alternately, he could be, as he says, the one who never lost control, the man who never let his imagination take him where it would. Just common David Jones, living out a quiet life in Bromley, rebuking his extravagant alternate self. The second verse broadens the scope, moving from the stairwell to the world. Bowie wanders, in exile or heading home (one and the same), and tries to find community in the fact that others are in the same straights as he. But the singer’s questions remain open, the riddles only answer themselves, and there’s no resolution. The song fades out with wordless moans and an cycling guitar, seeming to end before it began. I passed on with an inward shudder. I was so identified with my secret double that I did not even mention the fact in those scanty, fearful whispers we exchanged. I suppose he had made some slight noise of some kind or other. It would have been miraculous if he hadn’t at one time or another. And yet, haggard as he appeared, he looked always perfectly self-controlled, more than calm—almost invulnerable. Joseph Conrad, “The Secret Sharer,” (1909). Mick Ronson and Visconti’s arrangements, like Bowie’s language, had been heavy, dark and convulsive for much of the record, but as with “The Man Who Sold The World”‘s lyric, suddenly all is simplicity and clarity. Ronson’s opening guitar riff is basic enough that guitar teachers use it as a lesson for beginners—hold the G string down and play three notes (A), lift your finger up and play a fourth note as an open string, then simply slide your finger along the same string from the second to the third fret and back again, lifting your finger up at the end (which creates the circular hook). The chorus is even simpler. Visconti on bass, then Ronson, then Ralph Mace (or Visconti) on keyboards, all follow the same path: they are simply playing scales, as if pupils in a band class—first the C major scale, then the F major scale. A sudden move to B flat casts a shadow for two bars, and then the cycles resume. Sometime in the late 1980s Chad Channing, a Seattle-based drummer, found a mint The Man Who Sold the World LP in a shop and dubbed it onto cassette, as you did in those days. He played the tape while driving around his bandmates, Kurt Cobain and Krist Novoselic, and Channing recalled that when Cobain first heard “The Man Who Sold the World,” Cobain was baffled to learn David Bowie was singing it (this was the era of the “Let’s Dance” MTV icon Bowie, who seemed light years removed from the likes of The Man Who Sold the World). In November 1993, as Cobain and Novoselic’s band Nirvana (Channing had left in 1990) began what would be their final tour, they came to New York to record a session for MTV’s Unplugged. Determined to irritate the biggest commercial force in music at the time, Nirvana told Unplugged‘s producers that not only would they not perform “Smells Like Teen Spirit” acoustically (thus defeating the whole purpose of Unplugged, which was for bands (and MTV) to cash in by turning their greatest hits into easy-listening standards, like Eric Clapton turning “Layla” into a cocktail-hour blues), but also that half of their set would be obscure covers: three Meat Puppets songs, a Vaselines track, a Leadbelly blues and “Man Who Sold The World,” which, as far as MTV was concerned, might as well have been a Bowie outtake. The songs Nirvana performed that night were tainted and distorted after Cobain’s suicide five months later, forced into new shapes—“All Apologies” became a self-requiem, “Where Did You Sleep Last Night” a final curse, “Plateau” and “Lake of Fire” visions of the afterlife. And “Man Who Sold the World” became Cobain’s catechism. Where Bowie had sung “The Man Who Sold The World” dispassionately, as if at a remove from his own terror, Cobain sounds betrayed and disgusted (with himself, with whatever alternatives he’s presented with on the stair); whatever fear the figure on the stair means to invoke by saying he’s The Man Who Sold The World, Cobain simply deflates. He’s done his share of selling, after all. But Cobain’s voice catches on lines like “He said I was his friend,” which he offers in a tone of weary disbelief, and he plays his allegedly unplugged guitar through a hidden amplifier. The time leading up to [Cobain’s] death was really strange. He disappeared. He just seemed like he wanted to get away. He bailed. I honestly did not think he was going to kill himself. I just thought he was on someone’s floor in Olympia, listening to albums. Or something. Dave Grohl, interviewed by Austin Scaggs, 2005. Nirvana kept “The Man Who Sold The World” in its set throughout the following tour (here’s Inglewood, Calif. (30 Dec 1993) and Modena, Italy (21 Feb 1994), including their final concert in Munich. The tour ended: Cobain made his way back home to Seattle, where he died alone. Tomas put out his hand. The Martian did likewise in imitation. Their hands did not touch; they melted through each other. Ray Bradbury, “Night Meeting,” (1950). Before this, Bowie had revisited “The Man Who Sold the World” only twice. 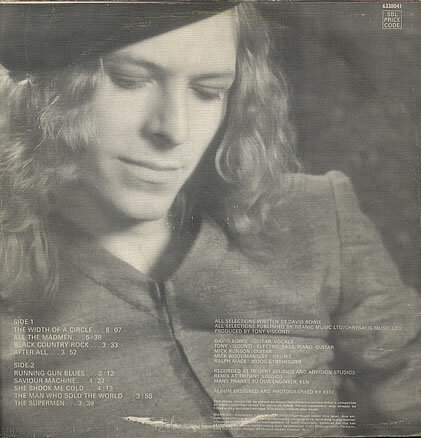 In 1973, embarking on a mild Svengali relationship with the Scot belter Lulu, Bowie revised the song as glam disco, centering it on a new Ronson riff and a saxophone he played himself. 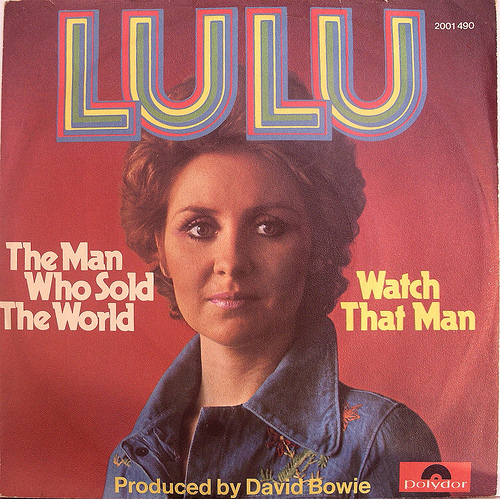 Lulu sang the hell out of it (in the studio, Bowie had told her to smoke cigarettes to make her voice raspier), dressed up for the promo video in a gangster suit. But the song was flattened out and distorted, its questions barely discernible beneath the flash and glare. And on one of the last weekends of the Seventies, Bowie played Saturday Night Live. 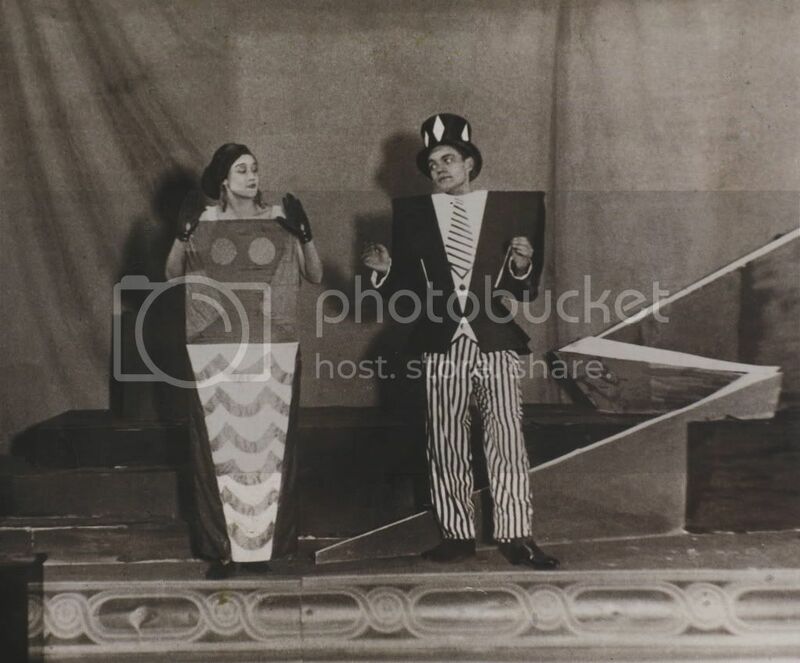 Those watching TV that night must have wondered if a European avant-garde theater troupe briefly had commandeered SNL—Bowie, in a giant Dadaist tuxedo (inspired by a Hugo Ball performance in which Ball had been carried onstage in a tube, as well as Sonia Delaunay’s costumes for a 1923 Tristan Tzara play), was hoisted like a placard by two vampires in red and black dresses (Klaus Nomi and Joey Arias), and backed by a band including Blondie’s Jimmy Destri (filmed making ridiculous faces while playing two keyboards). The gorgeous outro, with Nomi and Arias’ counter-tenors swirling around Bowie’s voice, had a severe finality to it, a sense of being a last aria. You could imagine, at the performance’s end, that Bowie never intended to play the song again. But Nirvana’s cover, played on TV throughout the spring of 1994 (MTV was running “Nirvana Unplugged” seemingly around the clock), suddenly exhumed the song, and “The Man Who Sold The World” was out of Bowie’s hands. Many kids even thought the song was a Nirvana track (despite Cobain’s earnest introductions on stage that “this is a David Booooie song”), placing Bowie in the odd position of, if he revived the now-popular song, being accused of covering his own composition. A year later Bowie made his move: he gutted the song, making what he did in the Lulu version seem like minor outpatient surgery. Erasing everything familiar (the vocal melody, Ronson’s riff, the chorus scales) as if it was the speech bubble of Weller’s cartoon, Bowie left only the lyric, stripped bare over a minimalist electronic beat. He sang it quietly and sadly, the puzzles that the song once offered now not even worth trying to solve. Finally Bowie seemed to make peace with the song, offering a fairly “traditional” version in 2000 for a BBC performance (a version that, to be honest, sounds like a Nirvana cover). By the time of Bowie’s Reality tour of 2003-2004, “The Man Who Sold the World” had become part of Bowie’s canon, along with “Changes” and “Young Americans” and “Ashes to Ashes.” Bowie sang it as if had been one of his standards all along: he had reclaimed a child who had been stolen from him and, in the process, had outgrown him. “The Man Who Sold The World,” originally recorded ca. 8-22 May 1970, was the penultimate song of the LP it titled; lurking between the bombast of “She Shook Me Cold” and the closer “The Supermen,” its cold power was, if anything, magnified. It was the B-side of a few singles, including a 1973 RCA reissue of “Life on Mars?” Lulu’s 1974 single (Polydor 2001 490) hit #3 in the UK and was collected on her 1977 LP Heaven And Earth And the Stars. A truly god-awful cover, with the Lulu track as its apparent inspiration, was cut by the young John Cougar in 1977. The Bowie/Nomi/Arias recording, from 15 December 1979 (they also did “TVC-15” and “Boys Keep Swinging”) has never been released, either on DVD or CD. 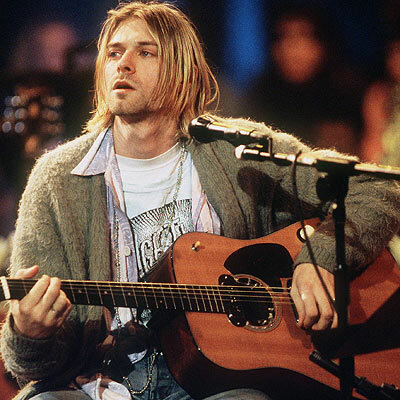 Nirvana’s version was recorded on 18 November 1993 and is found on Unplugged in New York; Bowie’s 1995 remake, mixed by Brian Eno, was released as the B-side of “Strangers When We Meet”; the 2000 live performance, recorded 27 June 2000 at the BBC Radio Theatre, is on the bonus disc of Bowie at the Beeb; the final version featured here was recorded in Dublin on 22-23 November 2003 and is on the A Reality Tour DVD. Top: Gov. 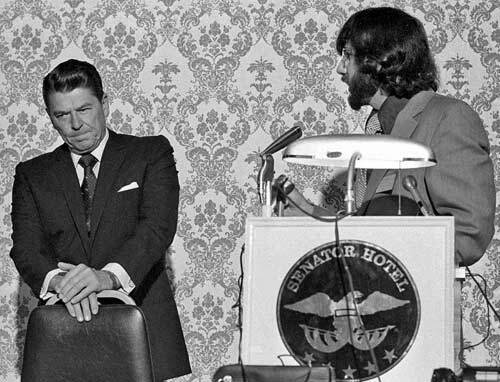 Ronald Reagan debates Irving Wesley Hall, Sacramento, Calif., 1970.